Worked on UR web page today. 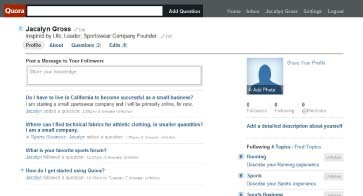 I found a website called Quora which is a site kind of like Yahoo Answers with a community and far more detailed. You can pose questions to your Facebook or Twitter community and other individuals on the web. Like Twitter you can also follow, but instead of just people you can follow their questions and you can also follow different topics. For example, I am interested in sportswear and business, I can follow a topic called “Sports Business”. I am excited to see where this goes. Now all it needs are people to get involved in these question and answer sessions. Posted by jaqviva on November 8, 2010 in Uncategorized and tagged facebook, quora, twitter, UR.